What led you to take up the study of Unity? 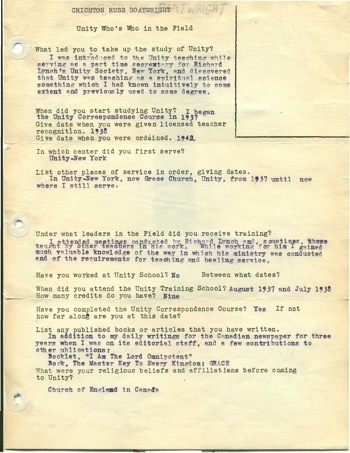 I was introduced to the Unity teaching while serving as a part time secretary for Richard Lynch's Unity Society, New York, and discovered that Unity was teaching as a spiritual science something whioh I had known intuitively to some extent and previously used to some degree. List other places of service in order, giving dates. In Unity-New York, now Grace Church, Unity, from 1937 until now where I still serve. Under what leaders in the Field did you receive training? I attended meetings conducted by Richard Lynch and sometimes those taught by other teachers in his work. While working for him I gained much valuable knowledge of the way in which his ministry was conducted and of the retirements for teaching and healing service. List any published books or articles that you have written. Booklet, "I Am The Lord Omnipotent” look. On this sheet give an account of any outstanding healings, either of yourself or of those to whom you ministered. Give any dramatic events, history of your background etc. "so-called incurable diseases have been cured; broken bones have knit at a speed amazing to physicians; quickly, 'insane' ones have been 'made whole.' Would-be suicides have been 'redeemed' with the acknowledgment from themselves, 'Someone has been praying.' 'Miraculously,' protection has been manifest for those in apparent danger. With startling rapidity, homes have been found where, to all appearance, no homes were available. 'Jobs,' good and satisfying ones too, have 'come to light' speedily, in perfect ways — without nepotism, catering and bribing. Harmony has been manifest out of seemingly insoluble discord. Ability in a chosen work has flowered beautifully. Supply has come when, to human sight, every door was closed." The case of healing of broken bones was considered, by the two attending physicians one of the most remarkable in medical history. Having broken seven bones in her foot, woman was walking perfectly inside two weeks, with only a small bandage unnoticeable inside her pump. DRAMATIC EVENTS. My life seems to have been full of dramatic events from the time when, at an early age, I learned I was named for the sixteenth century Admirable Crichton from whose family I am descended (and who had a very dramatic life himself) but since these events involve other people, few of them can be told. The outcome of all of them has steadily strengthened my faith in the Divine guidance, power, protection and provision — the most loving Grace. This was especially evident in the writing and bringing out of my book on Grace, as very suitably I suppose, it should have been. I'm enclosing the relation of some of these evidences which I jotted down for the publishers. HISTORY OF BACKGROUND: The attached leaflet "About the Author of Grace" gives an idea of this. More fully: the ancestors of whom I know were mostly of the English and Scotch nobility and gentry, early pioneer and later settlers in America and Canada. Some of these had as forbears the Plantagenets of England and the Stewarts of Scotland. My maternal great grandfather was one of the Governors of Plymouth, England, in the reign of George III, before it became a city. I have, among other things, the mace he carried as insignia of office. A family of cousins in Canada was founded in Britain by a centurion in Caesar's army who married one Cleopatra's ladies in waiting. The descendants of these ancestors have become, or married, business men, a pioneer newspaper publisher (long dead before I became a newspaper woman), manufacturers and inventors (including my grandfather and father), a member of parliament and professional men with a fair sprinkling of ministers of the gospel. My father's uncle, minister of one Methodist church in the city where we lived was instrumental I'm told, in building two more Methodist churches there, and my Mother's father, himself a layman, with the help of the bishop of Niagara, was a founding father of an Anglican church.... .An English paternal great, great grandfather, a pioneer settler in Canada, had a remarkable gift of mental (?) healing power. In those early days men frequently got hurt in the sawmills. If word could be got to my great, great grandfather before the injured man bled to death, he could mentally (?) stop the flow-of blood instantly, providing there were no large stream of running water between him and the person needing help. I have interpreted this to mean, metaphysically: if there were no large stream of negative consciousness between them.